We all know content is important; after all, it was declared “king” by no less than Bill Gates eighteen years ago. Now more than ever, it’s not simply about creating content for its own sake, but rather about publishing quality content people actually care about. This is critical, because not only will improved content help you rank better in search engine results pages or Facebook’s News Feed, but it can also help you reach new customers. And isn’t that what marketing is all about anyway? So where do you start when trying to create “good” content? Your customers. Focusing on their needs and interests will help you generate content they will want to read, and better yet, pass along! If you put your customers first, you are bound to find success. Finding out what is on your customers’ minds and providing them the answer is one of the best ways to create something people will want to engage with. What are some of the most commonly-asked questions in your industry? Lend your expertise to help solve those problems. While exclusive deals can incentivize people to “Like” you on Facebook, posting sales messages on a daily basis may turn followers off and even lead to them unsubscribing from your social channels. Instead of constantly advertising, try selecting one powerful offer each week you feel will be of most value to your audience. With the release of Google’s Hummingbird update, it is more important than ever to develop content that is user-centric, as it is believed that the search engine will soon take into account social signals such as “liking” when ranking your content. 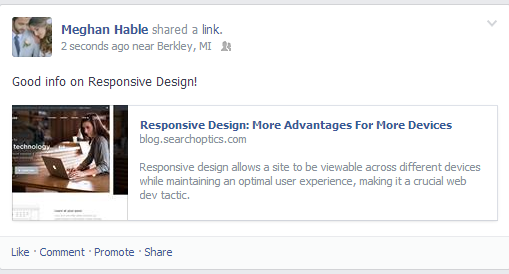 Therefore, don’t forget to include social sharing options on your website and blog posts to help your SEO. 90% of information transmitted to the brain is visual, and visuals are processed 60,000X faster in the brain than text. Besides being easier to read, web or blog content containing images is more optimized for sharing than content that does not. When someone shares an article with his or her network that contains a photo, the image will automatically populate onto most social sites, making the post more visually appealing. 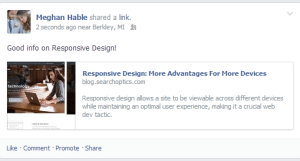 Adding images to shorter form posts on Facebook or Twitter helps, too. According to a study done by Social Bakers, 93% of the most engaging content on Facebook comes from images. As you can see below, the image on the left is of a post I shared containing a photo. Compare that to the same post shared without the photo on the right. Which would you be more likely to notice? A strong call to action (CTA) can be an effective way to prompt your user to engage with you. It can take the form of a question – “Which tip do you think will be the most beneficial to your content planning?” – or a recommendation – “Click the Like button to follow us on Facebook and get updates like these in your News Feed.” Posts containing CTAs get more engagement than those that do not. So you have tried all of the above, but how do you know what is working? Look at KPIs such as views, comments, and shares to see how many people are engaging with your content. Facebook offers a plethora of metrics that can also help show you opportunities for improvement. I hope these tips can help you make content a part of your marketing strategy. If you are a business that is looking for help with social media content planning or creation, Search Optics would love to work with you. Did you find these tips helpful or have a suggestion of your own? Let us know in a comment below. (See what I did there?) Happy content planning! The post How to Create Content Your Customers Will Want to Read appeared first on Search Optics Blog.